Space heating is the largest energy expense incurred by homeowners in the U.S. This statistic may make you want to immediately cross this option off of your list, but if you live in a warmer climate, this could be the most efficient way to stay warm this winter. Why? A space heater is designed to heat a single room as opposed to the entire house. In warmer climates, using a space heater to stay warm is less costly and more energy efficient than using another source of heat to warm up your entire home. To maximize the efficiency of a space heater, choose a model with a thermostat so you can control the temperature. This ensures you do not waste energy by overheating the room. It’s also wise to check the label to see how many square feet the model is designed to heat. Purchasing an oversized heater will lead to wasted energy and massive utility bills. Another energy efficient way to heat your home is with a heat pump. How does it work? All air contains some level of heat energy—even cold air. A heat pump is designed to pull the heat energy out of the outside air and use it to warm the inside of your home. Heat pumps do not generate heat, but rather move it from one place to another. For this reason, this heat source is rather energy efficient. There are many benefits to installing a heat pump, but this system is not right for everyone. Heat pumps cannot generate enough heat to keep you warm if you live somewhere with extremely cold winters. However, if you live in a moderate climate with warm summers and cold winters, a heat pump is a great option. In addition to keeping you warm in the winter, the heat pump acts as an air conditioner in the summer by removing warm air from the inside of your home. The vast majority of homes in the U.S. are heated with furnaces. A furnace is designed to heat air and distribute it through the air ducts in your home. Furnaces are considered central heating systems since the heat is produced in one location and then distributed throughout the home. 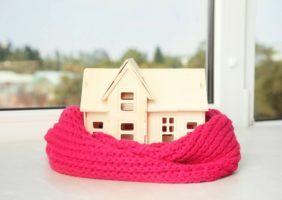 Since these systems are capable of heating the entire home, they are ideal for homes located in areas with moderate to extremely cold winters. If you plan on installing a furnace, make sure you choose a newer model. Older furnaces were not energy efficient, but the newer models are designed to convert nearly all of the fuel it consumes into heat. Furnaces are powered by natural gas, propane, heating oil, or electricity. If you want to maximize your energy efficiency, use natural gas to fuel your furnace. It’s estimated that natural energy is three times more energy efficient than electricity, and far more efficient than propane and heating oil as well, which means you can drastically reduce your utility bills and carbon footprint with this option. Using the right source of heat is not the only way to reduce your energy usage and utility bills this winter. If you want to save as much as possible, set your thermostat to 68 degrees Fahrenheit during the day and dial it down a few more degrees at night. This temperature is high enough to keep you comfortable, but low enough to avoid wasting energy. You can also use heat from the sun to warm the inside of your home during the winter. Keep your curtains open on sunny winter days to let the heat inside your home. At night, close these curtains to prevent the heat inside your home from escaping. This simple trick will maximize the efficiency of the heating system you use to keep warm. It’s also wise to prevent heat loss by adding insulation and sealing the cracks and holes around your doors and windows. About one-quarter of the heat inside your home is lost through cracks, holes, and poorly insulated walls and ceilings, so preventing this heat loss can make a huge difference. You don’t have to sacrifice comfort to stay warm this winter! Use this advice to get through winter without wasting a significant amount of money or energy on heating your home.